The Torin T31002 Engine Hoist – 1 Ton is suitable for use on small to mid size engines that usually weigh less than one ton. The hoist comes in a foldable mechanism which makes it very portable hence easy to store when not in use. For ease of use and mobility, the Torin T31002 Engine Hoist – 1 Ton comes with four wheels which also act as stabilizers for the hoist. The one ton engine hoist is manufactured from high tensile steel. 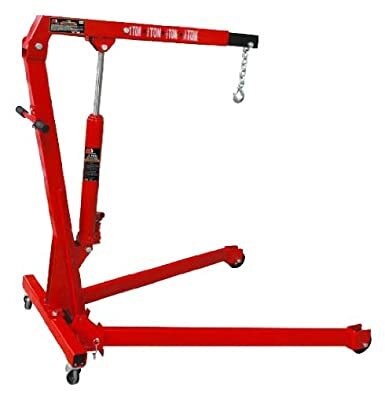 Lifting height of 1inch-78.75inch: – The variable range of the 1 ton hoist which is between one inch and 78.75 inches makes it possible to work on different cars coming in variable engine heights. 1-ton lifting capacity: The one ton capacity is adequate for use in the domestic as well as commercial sectors since most engines in personal cars usually weigh less than one ton. Heavy duty design: The hoist comes in a heavy duty design and also manufactured from high tensile steel which is very durable and will provide long lasting service with little maintenance costs. Four-wheel mobility: The four wheels ensure that the hoist can be moved around easily and conveniently. Foldable for easy storage: The quick and easy folding mechanism enables a user to easily and efficiently store the one ton Torin T31002 Engine Hoist. Height limitations make the hoist unsuitable for use in some vehicles such as trucks.